BBQ has been on my brain lately and in the process of looking for interesting recipes, this caught my eye. I loved the idea of a peach BBQ sauce along with pork and even better, the dish is made in a crockpot. The only thing that requires additional effort in preparing this dish is sauteing the onions in a pan before they join the party in the crockpot. Everything else is transferred in the crockpot and set to cook for a few hours. Once the pork is tender, it's chopped into bite-sized pieces. The remaining sauce in the crockpot is transferred into a saucepan to thicken. 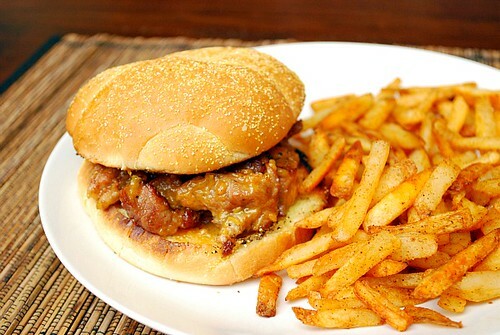 When that's done, the chopped pork is tossed in the peach bbq sauce and served up on a bun. Some notes - if you prefer to shred the pork instead of chopping, do so! Also, you can skip thickening the sauce. Feel free to simply toss the chopped pork right into the crockpot with the remaining sauce, toss and serve up. Place the pork in the bottom of a slow cooker and add the peaches over the top. In a saucepan, heat the olive oil. Add in the onion and cook until translucent, transfer to slow cooker. Combine the cider vinegar, Dijon, Worcestershire, brown sugar, pepper, garlic powder, ginger, and ketchup in a small bowl and pour over pork and peaches. Cover and cook on low for 6-7 hours or until the pork is cooked through and pulls apart easily. When the pork is done, remove it to a cutting board. Transfer the bbq sauce from the slow cooker into a saucepan. Bring the sauce to a boil and cook until reduced down and thickened, 15-20 minutes. Meanwhile, chop up the pork (or shred, if you prefer). When the sauce has reduced and thickened, add back into the slow cooker along with the shredded pork. Stir to coat the pork in the sauce and serve on hamburger buns. I really like this twist! I wonder it would be like to have the sweetness from the peaches and then spice it up a bit with hot sauce.... Wheels a turnin' in my head! This was the first recipe I've ever made of yours that I was even somewhat disappointed in. I did enjoy the pork, but the sauce was not all that flavorful to me. It just tasted like slow cooked pork, not really like a bbq pork sandwich.